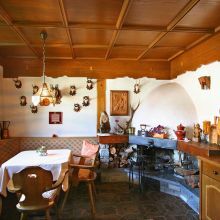 We offer 2 apartments in the house St. Christoph. A beautiful place for your holiday will hardly find for your holiday. Quiet and sunny at the edge of the forest, you are only a catwalk from the center. The cable cars in Mayrhofen, the tennis court and the Mayrhofen water park are just a 5-minute walk away minutes. The familiar traditional way how our house is run makes it to what it is - a place to feel good. Our 2 spacious apartments with balcony can accommodate 4 to 7 or 5 to 9 people. Each bedroom has a shower and WC. Modernly furnished and equipped with every comfort, nothing is in the way of relaxing holidays. On request, we will provide you with a separate stay / party room free of charge!